Last time in Project Humvee, we took a look into the basics of the Spectre range and assembled the chassis for the first two vehicles. This time around, prompted by the need to get some vehicles ready for an upcoming game, we’re going to cover the next step for this project. Adding some details, getting the current vehicles painted and then sorting out the next set of chassis and turrets. So in between the first post and now, I’ve actually done a few tweaks to the vehicles. Starting with Humvee One, the standard one. Seeing as this is designed to be the “normal” one that will probably end up being used by the regular forces, the base vehicle hasn’t had any add-ons installed. I did adjust the positioning of one of the armoured windows I mis-installed and filled in a gap I created on the rear bumper. Up top though, the turret got some improvements. After looking at the some of the pictures, I realised I had mounted the .50cal a little too low and would have caused some gun depression issues. To correct this, I installed a small column to life the gun up slightly. From the stowage kit, I pulled out the large ammo box and stuck it to the side of the turret. This was inspired by a picture from HMMWV in Scale, and made a lot of sense – after all, it means the gunner can grab a reload much faster than having to drop down into the vehicle. I also added a LAW tube on the interior of the turret – perfect for when something needs stopping and the .50cal isn’t working out. As you might expect, the SF Humvee had a bit more stowage added to it, seeing as that whole rear section is designed to be filled with kit. Starting with the exterior, I added the ever useful sand channels to the side of the vehicle, which should visually balance out the spare wheel and M240 on the far side. In the turret, I decided to keep things simple just adding a small Pelican case to the rear of the interior. Mentally, I see this as somewhere for the gunner to store all the kit they might need when running the turret, such as pen flares or tools. With the new launcher pack, I’m tempted to add an AT4 tube on the back of the turret but this will be painted and assembled once my next order arrives. Inside the rear section, I’ve added a pile of stowage items perfect for giving the crew a bit more firepower while also making sure there was plenty of space for anyone using the M240 to move around. The list of additions are. Large Pelican case: General stowage, anything from personal effects to medical or comms equipment. Small ammo box: General stowage, anything from ammo to additional grenades. Finally, I added two items on the rear bumper. The rucksack was put in place to cover up some damage caused by an air bubble, with green stuff filling in the bulk of it. On the other side, a jerry can helped to balance out the look. Painting on these vehicles was very similar to some of the other US vehicles I’ve done. Black basecoat, Humbrol desert spray and then touched up with a brush version. Other details were then painted before being washed in Agrax. Rather than leaving to dry as I usually do, I instead dabbed it off which prevented some of the strange patterns I had to deal with on earlier vehicles. I have a love-hate relationship with painting vehicles. It’s very easy to make them look bad but modern paint schemes means no faffing around with camo. Painting was done in an evening and although there are a few things I could touch up (like the central hubs on the wheel). I’d say these things are ready for the tabletop. So, with these vehicles finished, let’s look ahead at the next vehicle I’ll be assembling. The goal with this is to create another Humvee that can be used with regular army forces, so it will be using HMV upgrade Alfa and the partially armoured doors. This time, however, I’m going to make it a little special and outfit it with the FLIR camera from the new stowage set. This is partially inspired by the LRAS vehicles. A variant I learnt about from the book “Red Platoon”, these vehicles have powerful observation equipment. Instead of the turret mounted system of the real version, the rear mounted camera does the job of marking the vehicle out as something similar without requiring a specific turret change. I’m looking forward to using this in-game. Of course, the exciting bit is up top – the turrets. I find building .50cal turrets to be a pretty safe bet. It’s a multi-role gun, easily able to take out infantry and light vehicles a like. However, as various scenarios have told me, the automatic grenade launcher is also pretty common. I was planning to wait until Spectre made a Mk19 (much more suitable for Big Army, especially when playing games in the near past) but having seen more photos of the Mk47 in action, I guessed it was time to get one on the board. I am thinking of using the spare M240 I have as a secondary weapon in the turret, letting the gunner engage closer targets where a hail of 40mm would be unsuitable. That said, I do also like miniguns. Having already used the Spectre minigun when modifying turets for the Empress model, it was time to add another one to my collection. I can see it being used a lot on the SF vehicle, so I think I’ll put it in Turret Bravo with the greater protection. The main challenge is deciding where to put the ammo box. Finally, as I buy more vehicles, I’m slowly building a collection of unarmoured turret rings. As you might expect, this setup really isn’t suitable for most modern locations. However, it might be useful to have a few armed ones for less combat focused operations (such as interior policing or base defence) so at least one is having a .50cal added to it. As you can see, work is progressing on. Having a deadline for a project is really handy as it helps to focus the mind and add a sense of urgency. I’m really happy with how these two vehicles turned out and can’t wait for them to both be reduced to burning wrecks as is tradition for newly painted models. Next week will be another entry in Project Humvee as I frantically try to get vehicle 3 assembled and painted in under a week. I’ll also be looking at at the new stowage options and even getting one or two onto the vehicles. EDIT: Change of plans – I totally forgot to order the FLIR unit so next Project Humvee post has been delayed. So the first time you see it will be in the next battle report! I’ll freely admit, my wargaming tastes can be pretty focused on playing the modern period. I think it’s mainly due to finding large scale battles just dull. Don’t get me wrong, they are plenty impressive (I still get a kick out of seeing them all lined up) but it’s not particularly interesting to play. I’ll probably be thrown out of the wargaming world for saying this but it just normally ends up with blocks of forces being slammed into each other. As things become more modern, the importance of each small unit increase, up to the modern day where a fireteam of four men is the tactical unit of choice. On the other hand, I do also enjoy the more social side of wargaming. After the last few weeks which have been lacking in dice rolling and tape measuring, I just had to jump in on a game. So when I noticed Angus (of Edinburgh Wargames fame) grabbing the terrain I usually pick, I just had to get involved. The setting is Second Boer War, some time in the early 20th century. As the British Army advances into Boer territory, the commandos attempt to slow them by securing vital locations. This is one such position, the only ford for miles that can support the British logistics train. A familiar looking board – a dusty plain with a road and river running through it. This time, however, it’s South Africa rather than the plains of Bazistan. The Boers set up their defences by the river, with the Johannesburg commando taking position in the slit trenches in front of the river. On the other side, the volunteer commando digs in behind the wagons. Both commandos were mounted infantry, meaning their free actions (which don’t require a leadership check) allowed for movement rather than shooting. The plan was that this Pom-Pom was going to form the key part of the defence, able to out range the enemy rifles and maxim gun. Unfortunately, requiring 7+ to activate (combined with poor rolling) meant it spent most of the game standing useless. Behind the wagons, the commandos start to see the British filling the horizon. As well as large groups of infantry from the Devonshire and Gordon Highland regiments, the British also had a maxim gun, a field gun which could outrange the rifles of the Boers. The British also had a unit of cavalry that game rushing down the flank, across the river and then right onto the guns of the Volunteers. Worse, this is how they ended their activation, with a block of commandos ready to fire. Unfortunately, the Jo-burg Commando failed to activate for most of the game and so sat in their trenches and watched the enemy get closer. A pom-pon shell managed to pin some of the Devonshires but the Gordons charged in, pipes wailing and proceeded to give the Boers a taste of British steel. More bad news as the other Jo-burg commando were soon engaged by the Highlanders as well. The Pom-Pom, having slowed one unit, decided now was the time to dump all the ammo in the dirt and refuse to activate for the rest of the game. Things did not go well for the cavalry. The volunteers ripped them apart before they even reached melee range. Of course, the Volunteers could also see the rest of the British army was about to turn up and kick their heads in. Seeing no use in staying as the British were already in the ford, the Volunteers packed up and rode for the hills. As the game ended, and the Highlanders stormed the pom-pom sangar, the Devonshires finally got stuck in and routed the last of the commandos. I had a really fun time playing this game. Although we didn’t win, it’s was still nice to get the dice out and move some really nice figures around. The scenario was pretty stacked in the Brits favour (seeing as they had multiple artillery pieces and much better command and control) but it could still have gone differently. If I was to play it again, I’d have pushed the Jo-burg commandos to the other side of the river (meaning the Brits would need to cross the river to engage them). I’d also put the Volunteer commandos in the wadi, letting them pop off a few shots before using their mounted infantry perks (movement without needing to pass an activation check) to flee before the foot infantry got too close. What did I think of the rules? Well, like many of the rulesets from Osprey, I picked up the basics of The Men Who Would Be Kings within a few minutes of playing. You can easily see some of the similarities to Daniel Mersey’s rulesets (Dragon Rampant and Lion Rampant) in terms of the basic rules but it has a different flavour thanks to the focus on firepower. This battle was “rifles vs rifles” but it’s easy to see how natives vs empire would go. Overall, I think this is a nice ruleset if you want to get your colonial stuff on the table and play a game that’s easily finish-able in an evening of play (complete with the usual trips to the bar, photo taking and discussions on the usefulness of trenches in melee causing breaks). I’m sure there are rules that are more realistic but as someone with limited knowledge of the period, these were great for me. And before you ask, no I am not going to collect a Colonial army. I already have enough side projects. Let’s start this Wargaming Week, covering the 20th through to the 26th of August. This week’s post was all about the GRU OPERATIVES currently available from Spectre. I really like this range although the promise of new figures were just the kick I needed to get them finished off. I’m definitely going to plan some more missions using these guys. Special Artisan Service Miniatures now has a UK stockist in the form of Infamous JT. You can find the various SASM products at their site. Red Vector, whose buildings’ have looked at previously, has just finished a move and is now back to his usual tricks. I also think he’s up to some madness as he’s announced a cargo ship (inspired by the picture) coming soon. He’s mentioned it’s going to be 5ft long which is one hell of a centrepiece. If you’re looking for a way to use this, it will be perfect for one of the scenarios in Plausible Deniability. Table Top Tactical Simulations have shown off the painted version of their Flat Bed HEMTT truck. As you can see it looks pretty great, although it is only 1/56 rather than my preferred 1/50. By the sounds of it this will avaliable for pre-order soon, with delivery aimed for the fourth quarter. Okay so this week we have had a pile of new updates from Spectre. First up, lets kick off with some releases! Friday evening saw a pile of new stuff, including the stowage that has been previewed before (such as earlier this week). Rather than the previously released single pack, the stowage has been broken out into smaller themed sets, letting you pick up elements you need. It also adds some new items, like the Javelin rounds and some bergens (including the return of some from the old SAS Recon Patrol). The only items missing are the sand tracks but Spectre have said they will be coming soon. Additionally, these packs are now being cast in resin rather than metal, which may help to fix supply concerns. Just as I published my article on all the Russian figures available from Spectre, they decided to release a brand new pack! Luckily these guys are FSB rather than GRU so would have missed the cut anyway (at least, thats the excuse I’m going for). This killteam is dressed up for covert action but the guns are anything but. All the weapons designed for defeating body armour, from suppressed ASh-12.7 bulpup assault rifles to heavy hitting suppressed pistols. I really like these guys – with balaclavas and civilian clothing (as well as the massive rifles) they are perfect for shenanigans. Also the baseball cap + ear defenders look makes anyone cool. They match the same pricing as other squad packs and you can find them on the Spectre site when you’re ready to kick some doors. Finally Spectre put up their Q&A video! As well as showing off the wall of cool in their office, they also managed to answer plenty of questions, drop a pile of hints and even fit in plenty of interrupting dog. If you want a hint of what’s coming next from Spectre, it’s well worth a watch! No pictures but you can probably guess what got in my cart from Spectre. As well as the FSB kill team, I also grabbed a few other bits for building Humvee 3. This is going to be a regular Humvee (with the sloped back) and with an automatic grenade launcher up top, as well as the FLIR camera from the new stowage. Of course, I’ve also grabbed the rest of the stowage so I can make them look a bit more used. And of course… the minigun was back in stock so I just had to add it to the cart. Also not technically purchases but one of my friends has been cleaning out his old warhammer collection. While I mule the bulk of it to my wargames buddy in York, I did get a chance to pick a few figures out for my own collection. I was able to resist the pile of easy fit Space Marines (as they are tiny compared to the Primaris) but I couldn’t help but pick up the Dreadnought, some easy fit Termiantors and (a figure I’ve wanted since he first appeared) the downed pilot figure from Battle of Macragge box. The pilot is going to be a great character for Kill Team (possibly as an objective marker) while the others could be fun to house rule into Kill Team. For when things go very wrong. I managed to get some wargaming in this week! A quick trip to the wargames club saw me tempted in by a dusty plain and so I found myself in control of some of the Boers as the horde of the British Empire appeared on the horizon. I’m going to do a write up on Wednesday as I have quite a few pictures and it gives me a chance to talk about “The Men Who Would Be Kings” and playing pre-WW2 wargames. In terms of actual hobby work, it’s mainly been moving things forward. I assembled a few more Primaris marines for Killteam but most of the work has been on the Humvees. You’ll see more in this week’s post but I’ve finally broken out the paint. When looking at most people’s collections, it’s safe to say that Western SOF units make up most of them. However, for players looking for something different to bring to the table, the Russian Spetsnaz provide an elite force with some changes that make them visually and doctrinaly distinct. Spectre currently have a large range of Russian Spetsnaz available, and with a new group coming soon, now seems a perfect opportunity to look over the current range. Please note there is a pretty big jump in painting style between these figures so expect to see some paint schemes done back in 2015. The current Spectre Spetsnaz can be split roughly in half, with the first wave of release designed for general field operations while the second is more focused on urban operations. The general operators look a little similar to their Western counterparts, with fast helmets, modern BDUs and plate carriers. However, there are plenty of changes to make them stand out. Some of the figures are wearing Russian designed helmets while all the load bearing equipment (plate carriers and vests) is slightly different from those on the Task Force Operators range. The close quarters operators share much of the same basic kit but have a few additional items more suited to fighting room by room. The most obvious is various operators with different helmets, including several equipped with visors to protect the users face. Another addition is that several models are wearing fragmentation protection suits designed to protect against blast fragments – a useful bit of kit when clearing rooms. Finally, more of them are wearing armour protection that includes a pelvic plate. Basically, these are the guys kitted up for kicking your front door in and then working their way through every room. As always, the bulk of your force will be your riflemen. These guys, armed with assault rifles and carbine are most of the figures you’ll need when assembling your force. For the Russians, the riflemen are armed with a selection of AK variants from the AK-74SU up to various AK-100 series weapons. These guns are kitted out with a selection of red dot types, lasers, torches and suppressors. They also have rail kits and stocks that look like Zenit products to make them look even more Operator. Overall there are 6 riflemen in the first release (4 with assault rifles and 2 with carbines) in a selection of moving and shooting poses. For the second release there are only two riflemen, both with assault rifles, but both are also wearing the additional protective gear (including one of them in a frag suit). There are also a selection of Russian figures armed with SMGs. In the first wave, there are two figures equipped with suppressed SR-2s. These are great for pointmen on covert operations, taking out targets at close range quietly. The second wave also has two SMG figures, but these are not armed with tiny SMGs designed for room clearing. Instead, these two are armed with AS VAL, an integrally suppressed rifle firing the specialised 9x39mm round. The round is subsonic (so perfectly for use with a suppressor) while also remaining capable of piercing armour at a reasonable range. Both of these figures have pretty well modified VALs, with sights and torches. These actually present a pretty interesting weapon seeing as they can easily fit the role of assault rifle (especially in terms of lethality) at close ranges. When thinking about support, the first stop is suppression. Wave 2, more foucsed on urban operations, doesn’t include a machine gunner but Wave 1 does. This figure is armed with an RPK which is great for a putting some extra fire down as part of a rapidly moving force. Of course the other way of suppressing is to start blowing things up. The Spetsnaz range includes three figures armed with explsovie weapons. The first is an AT Gunner, armed with a RPG-18 with a slung Vityas SMG as backup. The RPG-18 won’t kill an MBT but is perfect for taking out technicals or busting structures. The other figures are equipped with one of my favourite bits of Russian kit, the GM-94 grenade launcher. With a minimum distance of 5m, this launcher is designed for use in urban fighting, letting the user throw rounds into rooms in the same building as them. The Wave 1 launcher figure is also carrying an AK for backup (for example when you don’t want to wake the neighbourhood) while the Wave 2 operator just has a pistol, relying on his team to engage the enemy once they are reeling from the blast. As you’d expect, the CQB operators have a few more interesting options for specialists. As useful as the SMGs are at close range, a shotgun really can bring the pain. Wave 2 includes a breacher armed with a red-dot equipped Saiga 12, a semi-automatic magazine fed shotgun perfect for room clearing. This figure also has breaching tools ready to go. In other words, this is your go-to guy for FISH-ing. As a bonus, thanks to the Saiga’s design, this figure could pass as someone armed with an assault rifle – just in case you find yourself needing another rifleman. The final figure is equipped with a full length shield, leaving only his boots exposed. This shield has a vision slit and torch modeled letting you easily lead the team into darkened corridors while still being able to see possible threats. For self protection, the operator also carries a SR-2 SMG. Of course, the GRU are not just about kicking doors and going kinetic. The range also includes a few lower profile operators, perfect for your special operations. There are 5 figures in civilian clothing, complete with packs full of equipment or ready to hide your firearms from the locals. As well as being covert operatives, you could use these figures as part of a criminal group. They also fit together well with the Agents and Deniable Operators for more special forces shenanigans. So what do I think of the range? Overall, pretty great. There is a large variety of kit for players to pick from, with everything from covert agents up to heavily armed door breachers. It also gives players the opportunity to collect a Special Operations range that isn’t just fast helmets and railed M4s – now you get a chance to do some fast helmets and AKs! By combining the different waves together you could build some really cool scenarios utilising the different focuses such as clearing a town with the more mobile operators before the heavily armoured force assaults the stronghold. I think the only downside I can see is very minor and it’s regarding several of the wave two figures. There are several with quite obvious mould lines down the centre of the helmet which are plain to see even after I attempted cleanup and painting. These won’t matter from gaming height and I’m sure I just needed a bit more elbow grease to remove them but they are definitely there. Apart from that though, the rest of the figures are Spectre usual great casting style, with plenty of detail in the webbing and on the guns. When it comes to painting, I decided to go for SURPAT, as something different from all the multi-cam. Honestly, I’m not sure I was successful. The massive time difference between painting the two waves doesn’t help (although good to see I’m improving). This is definitely a case where the camo is there to mostly give the impression of camo rather than trying to replicate it exactly at 28mm. On the other hand though, these figures are very visually distinctive when put next to my Task Force Operator models. Of course, just as I finish this range the next one is coming up. As you can see from the preview above, we’re looking at some brand new weapon systems and updated gear. The new range seems to be based on AK-12 pattern guns in the various roles (assault rifle, LMG and DMR) as well as the PKP Medium Machine gun for extra firepower. It will be interesting to see how the range continues to evolve from here – the Russian arsneal is packed full of strange and unusual kit and the sheer variety of roles they Spetsnaz find themselves means we could see a lot of exciting stuff for years to come. Let’s start this Wargaming Week, covering the 13th through to the 19th of July. This week’s post was another part of Building A Force, this time looking at support for Irregular Forces. This articles are really handy on weeks when I’m busier than usual so expect a few more before the end of the year. The Assault Group this week released a new range. Well, a new range for them. Consisting of three sets (and two freebies), this range appears (based on comments on the news post) to be a re-release of a previous range. Unusually for TAG, these are sculpted by eBob and stand a little smaller than most modern figures. However, they present an alternative option for players wanting to play the Chinese for the mid 2000s. The White Dragon Miniatures quad bikes are getting closer. Dwartist has received their quads and will soon be working his magic on them. As you can see in the picture, and as you’d expect from the Courage in Contact range, there are multiple variations of cargo and rider giving you plenty of customisation options. More details on them as it comes in. Nothing this week, still busy painting things. Saving my pennies to pick up another Humvee from Spectre once the gunners and new stowage becomes available. I’ll probably also grab one of the new Luxury SUVs at the same time. Main task this week was getting the pile of releases from Salute finally based up and undercoated. It took me a while to get all the figures based up (the bikes and carts causing problems) and then they have sat for months waiting for me to sit down and add the basing material. Having a slow evening I broke out the extended version of Gladiator, a box of sand and started applying the PVA glue. I’m also carrying on painting the Russians – I just have to remind myself how to paint SURPAT. Luckily there are only 9 figures to paint and most of the post is already mostly written so expect some thoughts on Friday! Let’s start this Wargaming Week, covering the 6th through to the 12th of August. On a roll from the week before, last week’s post was taking a look the US Army range from Empress. This is a range that I’ve been building up as part of a platoon project, ready for larger games and complete with various support elements. It’s not 100% finished so you might be seeing a few more US Army guys being painted up. We have a new arrival this week in the news. Black Site Studio produce pre-painted MDF building kits and this week pre-orders have gone up for a small bank. This grabbed my attention, mainly due to the various materials used and the detail available. The layout should be familiar for those used to hearing about a broken down POS drill and I think this kit could be great for those whose modern gaming is more “small town USA” rather than the middle east. The day is finally here! Tiny Terrain has released the figures from the first Chechnyan War kickstarter. Seven packs of Chechens and five packs of Russians gives you a selection of figures to pickup (although I have heard they can be a little RPG heavy) and all are in Igor’s great sculpting style. You can pick them up from the site at https://tinyterrainmodels.wordpress.com/ . Spectre had another lapse in the OPSEC and have shown off a new preview of an upcoming range. Having already been glimpsed in the background of some previous preview images, they can now finally reveal that the upcoming figures are some updated Spetsnaz. These guys are based off more modern photos of the Russian SF in action abroard and are armed with various versions of the AK12 along with PKP MMGs. If you look closely you can see some really nice detail on the clothing and webbing kit. However, my favourite feature has to be the backpack ammo feed on one of the MMG users. I don’t know why but its just so dangerously sci-fi. Seeing as these guys are full sculpted (and in a reasonable number for a release) they will be coming pretty soon. In unrelated news, guess who is rushing to finish the pile of Spectre Russians sat on his desk. Expect a range impressions in the next few weeks. But that wasn’t all! This week also saw Spectre tease and then release a new Luxury SUV for their civilian vehicle range. This is a nice counterpart to the other SUVs that Spectre have sold, giving a different style that will make telling the good guys in SUVs apart from the bad guys in SUVs. I’m looking forward to picking one up the next time I order from them. If you’re wanting your own, you can find it on the Spectre site. Yep, it’s that time of year! The Great Wargaming Survey is back for 2018, letting WSS know just what the wargaming public want to play and be in the hobby doing. As always, you get a 15% discount from Karwansary once you finish the survey and you can also enter to possibly win some prizes. As you might expect, Ultramoderns is normally quite far down the chart so lets see if we can change that this year. Nothing wargames related – much more focused on getting my way through the lead pile! The big thing this week was finishing off the US Army figures. As you can see from the collection above, I have two full squads, a command element and a few support teams (such as the EOD guys or the spare fireteam. I’m tempted to pick up another pack so I can have the total of three squads (while pulling the squad leader out of the EOD team). The next step for making this almost platoon size will be picking up another set of Strkyers to carry the rest of the platoon. If you’ve been following the blog you know I’ve been busy with work reccently. However, I took Thursday night off – this was both to have some relaxation during a busy time but also to remind the local wargames club I’m still alive and still like rolling the old dice. This time, I managed to jump into a game of Frostgrave. We played it in 15mm (ish) and I had a whale of a time. There were wizards controlling bears, there were henchmen being flung through portals and there was some classic multiplayer shenanigans. Overall it seemed like a great little game – so maybe I need to grab some more magicians for the dungeon delving project. So what’s now on the workbench? Well the Russians have moved up the list but I’m also wanting to clear some table space. I have a pile of things I haven’t got round to basing and undercoating yet so I did some utility tasks. I even broke out some greenstuff to tweak the Empress US Sniper in Crye gear. I’m still deciding on the post for Friday but it might be time for another part in the Building A Force series. When going back to do my Range Impression on the Empress SAS, I found myself delving into the release history of Empress. Which of course reminded me of their second release set, the US Army Infantry. Having just finished the Strykers, now seemed the perfect time to get the last couple of figures finished and take a look at this range. The range of figures is designed to represent US Army Infantry around 2010. Weapons are M4s for most, with M249 SAWs and M203 UGLs to extend your firepower. As you’d expect, these are the usual Empress style, with four figures in a pack and mostly separate heads. The heads included in the packs are wearing ACH helmet (some with additional light units) with some also wearing eye protection. There are also a pack of heads with monocular NVGs if you want the alternative look for doing business after dark. You may notice a few of these guys are not wearing their issue helmets and have instead have donned MICH and high cut helmets (sourced from the US Rangers collection). Now, I must admit the addition of these may be partially down to playing a lot of Modern Warfare 2; I really like the combination of kit and just had to add the variation to my force. It also makes it easier to pick out specific figures on the battlefield. Painting wise, I went for the UCP look. The technique I ended up using was designed to be super quick while still being effective at communicating the look, in particular of well used kit. The end result is not as crisp as it could be but (like most of my painting) I think does the job and gets them ready for the tabletop. Team 1 shows off a fireteam on patrol. They have a good mix of guns, including a M4/M203, M249 SAW and even a M14-derived DMR. The pose are all great for troops at the start of an engagement or moving alongside a vehicle. And then there is the flipping team leader who seems to have become entirely jaded with the concept of being in the middle of a tiny firefight and is instead enjoying a smoking break. I can see the point of including this figure in the pack (especially for those wanting to build dioramas) but he does look a little out of place in the battle. Even if I’m not a fan of him, he does fit in with the rest of his squad. Team 2 is another fireteam. However these guys do not have the DMR backup but are instead posed as if they are moving under fire. There are also some nice details such as the pelvic plate on one of the figures. The final fire team pack has the team engaging. The grenadier and rifleman are aiming down sights while the Automatic Rifleman and team leader are preparing to get into the fight. As with all the figures, there is a nice variation in terms of webbing gear based on the role. Pack 4 gives you a few extra figures perfect for more command roles. These can be either used as attachments to to a squad (with one figure being the squad leader) or as a separate command element. The two riflemen could be either an officer or NCO while the two specialists (medic with kit bag and radio operator with aerial sticking up behind his head) are perfect for bring some force multipliers to the battlefield. The first support pack is really designed for guys that are perfect for fitting into your squad. The AT rifleman (with M4 stashed on the ground) is just what’s needed for destroying light armour or wrecking enemy positions. The shooting DMR rifleman is a great replacement for the rifleman in a squad, especially if you need to reach out and touch the bad guys. Finally, the pack includes two figures (as well as belts of ammo) designed to form a M240 team when you need to create your base of fire for an assault. As an aside, I decided to replace the AT4 with one from the Spectre vehicle stowage pack to make it look a little closer to other AT4 users in my collection. Having done the conversion, I’m not 100% sure it’s needed but it’s a relatively easy upgrade. A great addition with this pack is just how much kit is included to really add to the bases. Both sets include enough M4s for the crew to return fire with their small arms. I also really like discarded helmet for the Javelin gunner. The last pack is a bit of special one. Perhaps inspired by a certain film, this three man pack gives you an EOD (Explosive Ordnance Disposal) team. Two riflemen provide covering fire while the third figure is in his bomb suit ready for the long walk. I love this pack – it’s a great set of characters and is perfect for setting up a different style of game. A great other use is if you only want to build a single squad. Two packs (chosen from team 1 – 3) and this EOD pack give you a full squad with one additional rifleman. Perfect for building on a budget. If you are looking for US Army Infantry, this range is pretty good. Some equipment has changed (more people would probably be wearing kneepads and the helmets have been slightly tweaked) and you’ll need to be painting them in Multicam rather than UCP but they are still worth picking up. The US Army has been pretty prolific so would be perfect for anywhere from Eastern Europe to the sands of Iraq to the mountains of Afghanistan. So what would I add? As with any regular forces, you can never have too many variations – another pack of infantry would be a neat addition and let you build up two squads using pack 1 – 3, the EOD pack and an additional one. The only other thing missing from this range (compared to the US Marines or the Brits) is a lack of heavy support weapons like the .50cal and MK19. That said, if you’re willing to work on it I’m sure you could do the conversion work with what is currently available. If you’re wanting your own US Infantry force, you can pick them up from Empress here. If you’d like some heavy metal to help out your US Army guys, you’re going to need some vehicle crew. 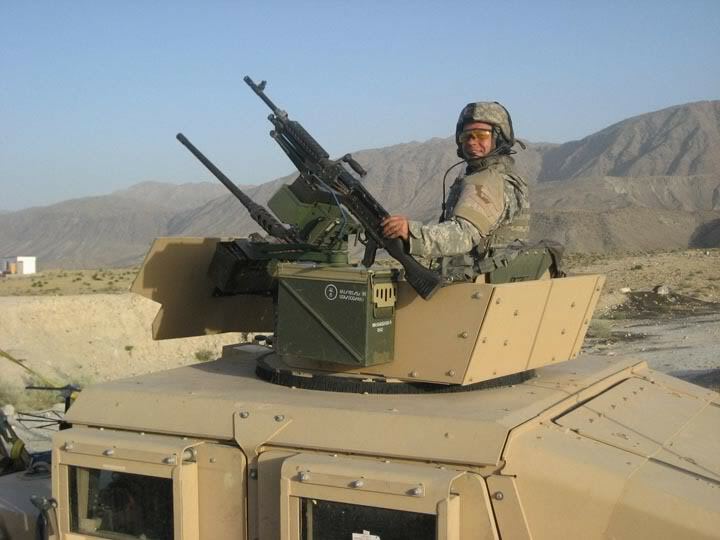 I took a look at the dismounted US vehicle crew in a post last year. Empress stocks several other ranges of US Infantry for different groups. If you’d prefer devil dogs and suppression through accuracy with the M27 (or maybe you just want massive 13 man squads), the USMC range is pretty comprehensive. If you prefer special operations, there are several small packs of US SOF teams (for both Army and Navy) as well as a comprehensive range of US Rangers. Expect to see articles on all of them soon as I work my way through the lead pile.